RIDM, Montreal’s documentary film festival, takes place in November, but festival organizers keep film fans supplied with documentaries throughout the year via the monthly Docville program. The presentation for Thursday, April 30, 2015, is Iris, a portrait of 93-year-old New York style icon Iris Apfel. It was the second-to-last film made by director Albert Maysles who died on March 5, 2015 at age 88. You might have seen Iris Apfel in the documentaries Bill Cunningham, New York (2010), directed by Richard Press, or Bury My Ashes at Bergdorf’s (2013) by Matthew Miele. Both films were shown here in Montreal at Cinema du Parc. 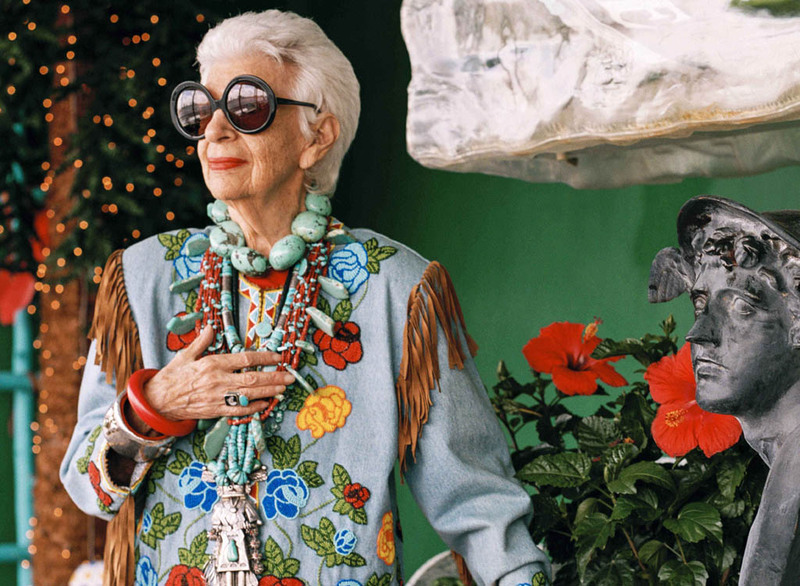 The documentary Iris is a portrait of fashion legend Iris Apfel, directed by Albert Maysles. Once seen, Apfel is not easily forgotten. She likes to wear several large necklaces at once, and covers her arms in chunky bracelets. As a look at the trailer below will show you, she isn’t one of those people who wears black all the time. More power to her, I say! The world is full of colour, so why not enjoy it as much as possible and as long as possible? Iris, directed by Albert Maysles, United States, 2014, 83 min., in the original English. Thursday, April 30, 8 p.m., at Cinéma Excentris, 3536 St. Laurent Blvd. Single screenings cost $12 ($10 for students and seniors). Tickets can be bought online. Doing so might be a good idea, since the Facebook page for Iris already indicates that 261 people intend to go. The Salle Cassavetes only holds 271 people and more than 1,000 (!) have been invited.